We are developing a number of additional plugins that will aid your workflow to and from Boords. The Boords animatic tool for After Effects looks to deliver a 'one click' answer to animatic setup leaving you with time to get creative. If you have any thoughts on how we could improve or develop these plugins just give us a shout. [email protected]. The tool sets up a composition (1920px 1080px) to the length of your sound file or to the number of seconds specified. It then imports the frames from the folder and distributes them evenly across the timeline. If you want it even adds a comp with all your frame notes (very useful when matching in points to VO). *BONUS - The plugin will work with any folder containing a series of images. Read the installation guide below to help you instal and open the tool bar in After Effects. Select the Boords folder that you have downloaded and unzipped and click open. Be sure to select the actual folder and not any of its contents. 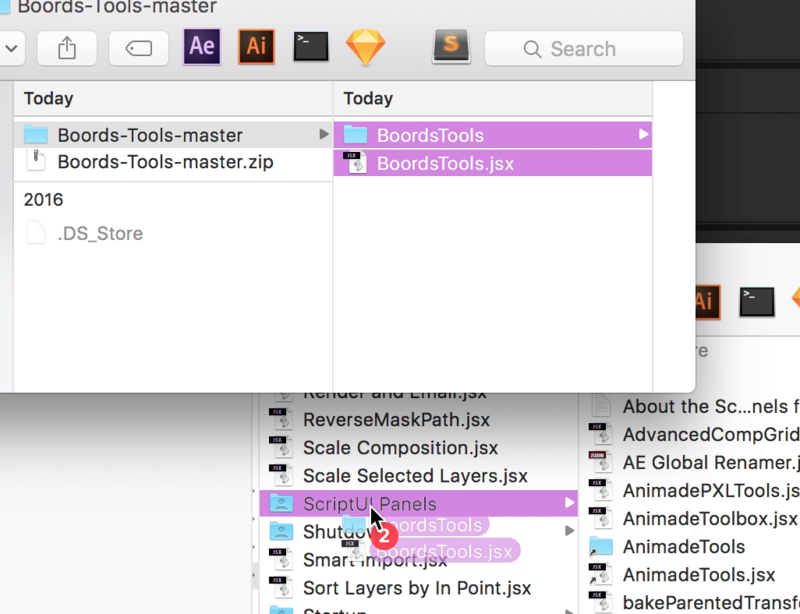 To download your storyboard from Boords click the icon in the top right of the edit view that reads 'Download frames and script' on roll over. If you don't have one click cancel and specify a length in seconds to build to. If you want the tool to create a reference layer with all your storyboard notes click OK when prompted. If not cancel and this will be skipped. This will take a minute or so for longer storyboards. Currently there is no clear loading message so please be patient. Now you just need to adjust the in points of the frames to match your desired timings. Close and reopen After Effects. In the 'Window' menu open the BoordsTools.jsx plugin. This will open the Boords Tools panel.